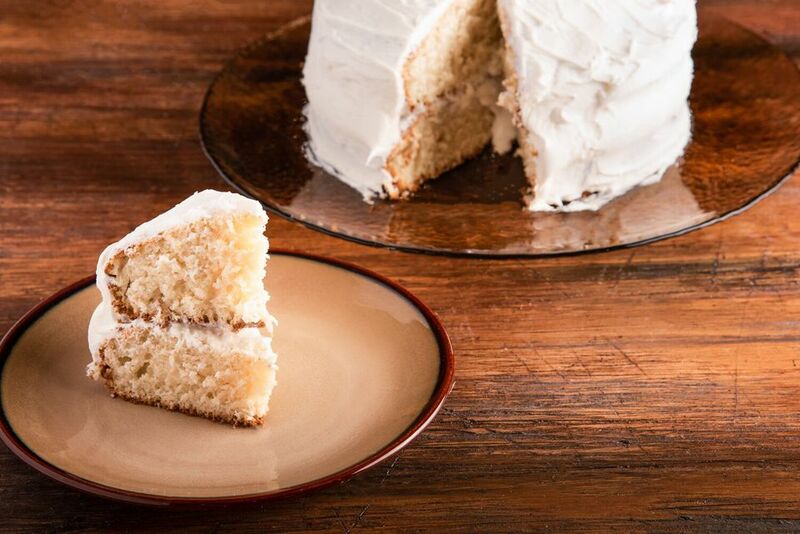 A white cake is made with egg whites (no yolks), which gives the cake a beautiful snow-white color. I prefer vegetable oil to shortening or butter for this recipe, since it makes the cake moister, and we lose a bit of moisture without the egg yolks. In a large mixing bowl, combine the flour, sugar, oil, baking powder, salt, vanilla, and half the milk and mix until blended. Now add the egg whites and the rest of the milk and whisk until everything is blended. Pour the batter into your prepared pans and transfer them to the oven. Bake for about 30 minutes or until a toothpick inserted into the center comes out clean, or with a crumb or two attached. You can start testing after 27 minutes because it's better to check too soon than to overbake. Cool the cakes for 10 minutes in the pans on a wire rack, then loosen the edges by running a knife along the sides, turn the cakes out onto the racks and cool for at least another hour before frosting. Don't skip the cooling process for the cakes before you frost them. If you don't wait until they are fully cooled, you run the risk of having the frosting melt off.